The Institute for Social Ecology cordially invites you to attend our annual Summer Gathering for a weekend of engaging political discussion, great food, and a chance to socialize with fellow social ecologists in the beautiful Vermont countryside. Events of the past year have triggered an exciting surge of public interest in Social Ecology. The transformation within the Kurdish liberation movement, the legacy of Occupy, the Sanders campaign, debates prompted by Black Lives Matter on the relationship between race and class, the inability of Syriza and other left parties to reign in neoliberalism; all these have all underscored the urgent need for Social Ecology’s holistic critique and reconstructive political vision. While grassroots movements like Occupy Wall Street and Black Lives Matter have energized millions, they now confront difficult strategic questions about how to move from protest to social transformation. This impasse often translates into radical energy being channeled into traditional electoral politics in the name of pragmatism. Yet despite inspiring calls for “political revolution” and “democratic socialism,” history has repeatedly shown the structural limits faced confronted by parties and electoral politics, resulting in a long line of disappointments from various social democratic parties, the German Greens, to the Obama presidency. This year’s gathering will address the relationship between the state, socialism, and social change, posing questions such as: how does Social Ecology point us beyond the pendulum of street protest and state power? How should radicals relate to state power and electoral campaigns generally? How do we assess the limits of electoral politics versus the limits of prefigurative politics? Why do many reject engagement with the state on principle yet embrace economic alternatives which remain embedded in capitalist power? How can we ensure our critique of the state does not unwittingly legitimize the neoliberal project of dismantling the welfare state? Why has no coherent socialist alternative to neoliberal capitalism emerged? What might this look like, and how should we get there? We hope you’ll join us for a stimulating weekend exploring these themes and more, while also taking time to relax, hike, dance, play pool, soak in the wood-fired hot tub, or swim in the solar pool. 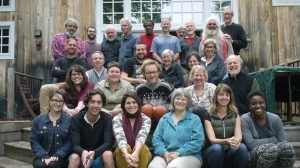 The gathering is a unique opportunity to renew the Social Ecology community in person, renew old friendships and make new ones, connecting with like-minded people from around the world. Format & Registration: We strive for a variety of different inputs which may include thematic panels, open group discussion, workshops, films, performance, presentations, and papers. To propose something or register, please email us at: social-ecology@mail.mayfirst.org. There is a sliding scale fee of 70-200 dollars to cover food and other costs, but we won’t turn anyone away for lack of funds (http://social-ecology.org/wp/donate/). Accommodations: There is camping and limited on-site indoor floor space, as well as a variety of local bed and breakfasts and motels (options on request). We look forward to a fun, engaging, and rejuvenating weekend – mark your calendars and join us!